Central to my approach to teaching is an acceptance of where each student is with their own practice so that they move and breath sensitively and without struggle. I am influenced by my own Yoga teachers (Mary Stewart, Monica Voss, Chloe Fremantle, Peter Blackaby, amongst others) and by the experience of teaching my students. I am also influenced by other movement disciplines, most notably the Feldenkrais Method, and I am currently a third year student on the four year London Feldenkrais training programme. All these influences inform my understanding, as do the principles of Mindfulness Meditation, a practice that I first began to explore in 2014. My personal practice nurtures me, enriches my life, and gives me the possibility of responding to challenges from a more reflective place. These are some of the wider benefits that I endeavour to share with my students when I teach. I am a British Wheel of Yoga Teacher Member and I am insured to teach through them. I am also a student teacher member of the Feldenkrais Guild UK. As such I teach yoga classes, Feldenkrais Awareness Through Movement lessons and Yoga and Feldenkrais workshops. 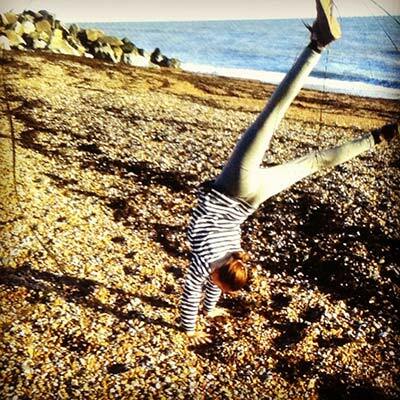 Most of my regular adult teaching takes place in Brighton and the surrounding area but I also teach day workshops and weekends nationally and I am Co-Director of the British Wheel of Yoga accredited London Yoga Teacher Training Course . 2011: completed the London Yoga Teacher Training Group (LYTTG) ‘Assistant Teacher Training Programme’, Levels 1 and 2.